We talk a lot about the various card technologies, their advantages and features, but the design and aesthetic of a campus card is important too. The general understanding is that card design elements reflect the university brand, mission and student body, but if you thought card design was overlooked by students, think again. 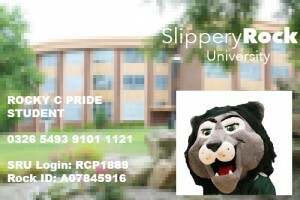 The new Slippery Rock card design. It has been announced that Slippery Rock University students will receive new student IDs during the first few weeks of this academic year. The functionality is expected to remain largely unchanged, though the new cards will feature a new aesthetic. The new card design has come under scrutiny from the university;s student publication, The Rocket, for a design that is “not representative of the best aspects of the university,” and “ugly.” The old card design featured a trademark of Slippery Rock’s campus, Old Main, a picturesque brick building. The new design, however has opted for the university’s Vincent Science Center (VSC), a building considered to be comparably less impressive. Social media polls and contests are regularly put on by universities and campus card offices to determine card design elements and ensure that these very concerns are met. Despite a less than sparkling review of Slippery Rock’s new ID, this serves as a reminder that students do in fact value the their campus cards, and maintain some sense of pride in carrying it.